Rounding Jeju’s southwest corner, Professor Kang Soon-seok points out a fissure in the underlying rock, separating it from the sweep of beach ahead: “Here we cross geological time,” he says. We are nearing the end of a “Geotour,” organized by Jeju Tourism Organization to promote Jeju’s “Geopark” sites. Throughout Kang has been on hand to enrich the experience with geological details - as well as to rail against the shortcomings that he sees in the Geopark program. Geological details are easy to miss when marvelling at the Yongmeori Coast, a basaltic tuff poking out to sea on Jeju’s south coast and, according to my guide, an area of immense geological value. Access to the rocky shelf ringing the peninsula descends into a gorge stacked with basalt columns, after which tourists pick their away around the shallow pools and squatting haenyeo (women divers) dicing squid The thinly stratified, undulating cliff face to the right is in striking contrast to the seascape and coastline views. The presence of the haenyeo at Yong-meori lends a sense of human history to the procession of dry geo-history. Although Kang frequently emphasizes the intertwining of the human and geological - mentioning the discovery of fossilized footprints nearby - his com-mentary is often academic and overly focused on chronology. We do learn, however, of the impact of Jeju Island’s porous rock on local agriculture. Kang says the lack of groundwater for irrigation forced locals to find alternatives to rice and also settle near the coast, where fresh water bubbles up from the bedrock. Our tour also took in the cathedral-like lava-dome, Mt. Sanbangsan, and a stretch of coastline to the west. It is, however, when Kang animatedly turns to the subject of local politics that things become more interesting. In 2010, Sanbangsan and Yeongmeori were designated as Geopark sites, a UNESCO-supported operation based on principles of sustainability, environmental education, and localism. The programme is a difficult balancing act, but Kang believes the local admin-istration has been negligent in its duties. “What was intended as a Geopark to be preserved, degenerated into tourism as a means to pursue profit only,” he claims, lamenting the fact that Mt. Songaksan, the remnant of eruptions just 3,800 years ago, was not listed and is now threatened by a planned tourist complex. Kang, however, still holds hope, insisting that awareness has increased markedly in recent years, leading to a groundswell of resistance to unchecked development. Thus, the future of the Geopark hinges on the ability of local guides and experts to tell the story of Jeju’s geological and human history in a compelling way. On this point the tour could be dramatically overhauled due to Kang’s detail-crammed delivery that lacked engagement and a unified narrative. It remains to be seen if local Geopark efforts succeed in their storytelling mission, a struggle experienced across the Korean heritage industry. 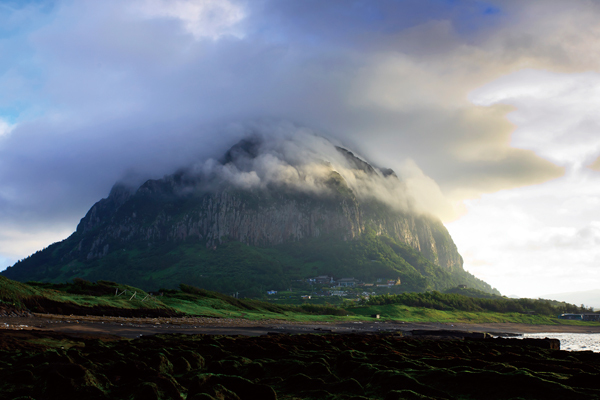 Certainly, a more charismatic and experiential approach would gain a higher profile for Jeju’s story. Given the swarm of development interests circling above, the stakes could not be higher.